DODGE CITY, Kan. (May 26, 2018) – Just one weekend removed from a wild heat race flip atop the 3/8-mile Dodge City Raceway Park, Taylor Velasquez bounced right back to win Saturday night’s 25-lap United Rebel Sprint Series vs. Precise Racing Products DCRP Sprint Car Clash main event. While the two-time and defending track champion posted his first win of the year, other Saturday night winners included Nick Link in IMCA Modifieds, Daylon Bergeron in IMCA Sport Modifieds, Shannon Maughlin in IMCA Stock Cars and Reagan Sellard in IMCA Hobby Stocks. Velasquez put the Bearcat Oil Services/Fronk Oil Co. No. 21x out front at the outset from the pole position and capitalized on a lap 20 caution that negated a Jake Martens pass for the lead to secure the win. Given a reprieve, Velasquez burst out to a lead of several car-lengths as the race restarted, but Martens closed back in and tried to slip under in the final pair of corners only to fall two car-lengths short at the stripe. Gunning into the lead at the drop of the green flag, Velasquez gradually slipped away from opening night winner Brian Herbert and Martens in the early going. Martens made his way past Herbert for second on the 15th round and erased Velasquez’ advantage in short order then raced into the lead on the low side only to have the race’s only caution appear to put Velasquez back out front. 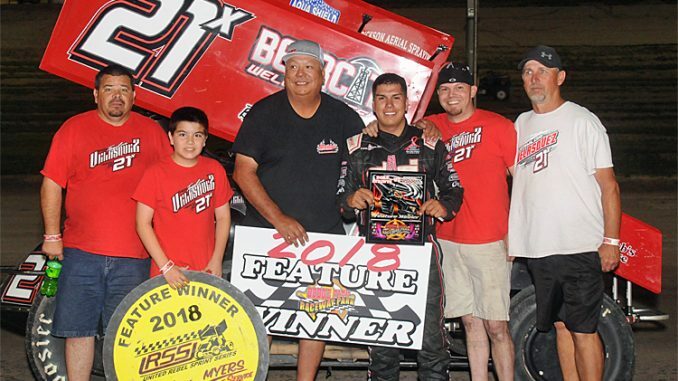 Velasquez took full advantage by going on to become the third different winner in as many rounds of DCRP Sprint Car competition in what was also the season opening event for the United Rebel Sprint Series. Martens settled for second with Herbert claiming the show position. Zach Blurton crossed the stripe fourth with Tyler Knight rounding out the top five. The 20-lap IMCA Modified main event featured a Link battle between the father-and-son duo of Tracy and Nick Link much of the way before the younger driver took command at the midway point and raced on to his first career DCRP win. Tracy Link gunned into the early lead from the pole position with 2016 track champion Nick Link making his way to second by the fifth round and soon challenging for the point. Nick Link took command at the midway point and opened up a half straightaway advantage over the field as the laps clicked off. Defending track champion Clay Sellard worked his way up to second with a handful of laps remaining but was unable to close the gap as Nick Link raced to the checkered flag. Sellard settled for second with Ryan Heger capturing third. Mike Lunow was fourth with Jack Kirchoff rounding out the top five. Woodward’s Daylon Bergeron foiled Alex Wiens’ bid for a first DCRP win with a last-lap pass to take the checkered flag in the 20-lap IMCA Sport Modified feature. With Bergeron moving forward from seventh, Wiens battled past Joey Maupin for the point on the third round and paced the field over the ensuing rounds. Bart Baker closed the gap on Wiens as traffic came into play over the closing circuits while Bergeron made his way up to fourth by the eighth round and then third on the 15th lap. Slicing through traffic, Bergeron took second away from Baker on the 18th lap and then slipped by Wiens on the low side after the white flag flew. Wiens settled for runner-up honors behind Bergeron with Baker in third. Jarett Lunow was fourth with Dustin Donley rounding out the top five. Dighton’s Shannon Maughlin made a long-awaited return to victory lane by leading the final half of the 15-lap IMCA Stock Car feature for his first DCRP score since the 2013 season opener. While Maughlin worked his way forward from sixth, Chris Oliver held off Gregg Schell for the point for a handful of laps before Schell took command in the spirited multi-car battle for the lead. Maughlin followed Schell past Oliver for second on the sixth lap and then battled into the lead two laps later. Maughlin led the rest of the way to take the win ahead of Dusty Witthuhn with Schell, Tyler Scruggs and Will Bauer filling out the top five. Bucklin’s Reagan Sellard battled past Dan Rogers for the lead midway through the 12-lap IMCA Hobby Stock feature en route to topping his first DCRP feature of the season. Rogers broke into the lead on the opening lap from the third starting position with Sellard making his way into second by the third lap. The race was on from there, with Sellard battling has way past Rogers just past the midway point. Sellard paced the field the rest of the way ahead of Rogers with Brett Copeland, Chad Kelley and Mike Davis rounding out the top five. Action resumes at Dodge City Raceway Park with on Friday night, June 8, with the Inaugural United States Modified Touring Series event atop the 3/8-mile DCRP clay oval along with IMCA Sport Modifieds, IMCA Stock Cars and IMCA Hobby Stocks. Heat One (8 Laps): 1. 11k-Tyler Knight, 2. 0-Steven Richardson, 3. 21x-Taylor Velasquez, 4. 51r-Ross Essenburg, 5. 17s-Chad Salem, 6. 33k-Aaron Ploussard. DNS: 18-Brandon Sprott. Heat Two (8 Laps): 1. 9-John Webster, 2. 48-Jake Martens, 3. 17x-Kade Hagans, 4. 10-Jordan Knight, 5. 33-Koby Walters, 6. 8J-Brandy Jones. Heat Three (8 Laps): 1. 2J-Zach Blurton, 2. 97-Brian Herbert, 3. 50-Jed Werner, 4. 28-Tracey Hill, 5. 911-Ty Williams, 6. 49-Kris Moore. “A” Main (25 Laps): 1. 21x-Taylor Velasquez, 2. 48-Jake Martens, 3. 97-Brian Herbert, 4. 2J-Zach Blurton, 5. 11k-Tyler Knight, 6. 33-Koby Walters, 7. 911-Ty Williams, 8. 0-Steven Richardson, 9. 51r-Ross Essenburg, 10. 9-John Webster, 11. 28-Tracey Hill, 12. 10-Jordan Knight, 13. 49-Kris Moore, 14. 50-Jed Werner, 15. 17s-Chad Salem, 16. 17x-Kade Hagans, 17. 8J-Brandy Jones, 18. 33k-Aaron Ploussard. DNS: 18-Brandon Sprott. Heat One (8 Laps): 1. 2L-Tracy Link, 2. 44-Mike Lunow, 3. 3h-Ryan Heger, 4. 1n-Nick Link, 5. 36-Travis Simmons, 6. 25-Kale Beavers, 7. 12-Kevin Tabor. DNS: a2-Randy Wilson. Heat Two (8 Laps): 1. 85c-Clay Sellard, 2. 88J-Jack Kirchoff, 3. 27-Grant Florence, 4. 26-Tom Beavers, 5. 22T-Trent Gray, 6. 57-Joel Lane, 7. 06-Chad Taylor, 8. 7n-William Nusser, 9. 16-Kevin Gray. “A” Main (20 Laps): 1. 1n-Nick Link, 2. 85c-Clay Sellard, 3. 3h-Ryan Heger, 4. 44-Mike Lunow, 5. 88J-Jack Kirchoff, 6. 2L-Tracy Link, 7. 22T-Trent Gray, 8. 16-Kevin Gray, 9. 7n-William Nusser, 10. 26-Tom Beavers, 11. 57-Joel Lane, 12. 36-Travis Simmons, 13. 27-Grant Florence, 14. 25-Kale Beavers, 15. 12-Kevin Tabor, 16. 06-Chad Taylor. DNS: a2-Randy Wilson. Heat One (8 Laps): 1. 4p-Daylon Bergeron, 2. 65-Kohl Ricke, 3. 92-Jeff Kaup, 4. 18-Kyle Wiens, 5. 7-Jarett Lunow, 6. 3d-Garrett Donley, 7. 12d-Brad Johnson. DNS: 09b-Brock Berry. Heat Two (8 Laps): 1. 21-Joey Maupin, 2. 10-Alex Wiens, 3. 16-Dustin Donley, 4. 37-Bart Baker, 5. 19-Terry Collins, 6. 4-Feddy McCoy, 7. 8-Brian May. “A” Main (20 Laps): 1. 4p-Daylon Bergeron, 2. 10-Alex Wiens, 3. 37-Bart Baker, 4. 7-Jarett Lunow, 5. 16-Dustin Donley, 6. 92-Jeff Kaup, 7. 8-Brian May, 8. 18-Kyle Wiens, 9. 12d-Brad Johnson, 10. 21-Joey Maupin, 11. 4-Freddy McCoy, 12. 65-Kohl Ricke, 13. 09b-Brock Berry, 14. 19-Terry Collins, 15. 3d-Garrett Donley. Heat One (8 Laps): 1. 17m-Shannon Maughlin, 2. 89-Gregg Schell, 3. 97x-Ondre Rexford, 4. 95-Tyler Tipton, 5. 22-Donald Kaup, 6. 20-Tyler Walker. Heat Two (8 Laps): 1. 3-Chris Oliver, 2. 10-Dusty Witthuhn, 3. 57-Will Bauer 4. 81-Tyler Scruggs, 5. 33-Marlin Hogie. “A” Main (15 Laps): 1. 17m-Shannon Maughlin, 2. 10-Dusty Witthuhn, 3. 89-Gregg Schell, 4. 81-Tyler Scruggs, 5. 57-Will Bauer, 6. 95-Tyler Tipton, 7. 3-Chris Oliver, 8. 97x-Ondre Rexford, 9. 20-Tyler Walker, 10. 22-Donald Kaup, 11. 33-Marlin Hogie. Heat One (8 Laps): 1. 2s-Reagan Sellard, 2. 72T-Tobby Schield, 3. 22r-Dan Rogers, 4. 19-Brett Copeland, 5. 81d-Mike Davis, 6. 7-Tom Reed, 7. 57-Chad Kelley, 8. 69-Danny Schulte, 9. 24b-Sheri Berger. “A” Main (12 Laps): 1. 2s-Reagan Sellard, 2. 22r-Dan Rogers, 3. 19-Brett Copeland, 4. 57-Chad Kelley, 5. 81d-Mike Davis, 6. 24b-Sheri Berger, 7. 7-Tom Reed, 8. 72T-Tobby Schield. DNS: 69-Danny Schulte. DCRP Title Chases Hit the Midway Point this Saturday!